When chemists from the Institute of Physical Chemistry of the Polish Academy of Sciences in Warsaw were starting work on a new material designed for the efficient production of nanocrystalline zinc oxide, they didn't expect any surprises. They were thus greatly astonished when the electrical properties of the changing material turned out to be extremely exotic. The single source precursor (SSP) approach is widely regarded as a promising strategy for the preparation of semiconductor nanocrystalline materials. However, one obstacle to the rational design of SSPs and their controlled transformation to the desired nanomaterials with highly controlled physicochemical properties is the scarcity of mechanistic insights during the transformation process. Scientists from the Institute of Physical Chemistry of the Polish Academy of Sciences (IPC PAS) and the Faculty of Chemistry of Warsaw University of Technology (WUT) now report that in the thermal decomposition process of a pre-organized zinc alkoxide precursor, the nucleation and growth of the semiconducting zinc oxide (ZnO) phase is preceded by cascade transformations involving the formation of previously unreported intermediate radical zinc oxo-alkoxide clusters with gapless electronic states. Up to now, these types of clusters have not been considered either as intermediate structures on the path to the semiconductor ZnO phase or as a potential species accounting for the various defect states of ZnO nanocrystals. "We discovered that one of the groups of ZnO precursors that have been studied for decades, zinc alkoxide compounds, undergo previously unobserved physicochemical transformations upon thermal decomposition. Originally, the starting compound is an insulator. When heated, it rapidly transforms into a material with conductor-like properties, and a further increase in temperature equally rapidly leads to its conversion into a semiconductor," says Dr. Kamil Sokołowski (IPC PAS). The design and preparation of well-defined nanomaterials in a controlled manner remains a tremendous challenge, and is acknowledged to be the biggest obstacle for the exploitation of many nanoscale phenomena. Professor Lewiński's (IPC PAS, PW) group has for many years been engaged in the development of effective methods of producing nanocrystalline forms of zinc oxide, a semiconductor with wide applications in electronics, industrial catalysis, photovoltaics and photocatalysis. One of the approaches is based on the single source precursors. The precursor molecules contain all components of the target material in their structure and only temperature is required to trigger the chemical transformation. "We dealt with a group of chemical compounds with the general formula RZnOR, as single source pre-designed ZnO precursors. A common feature of their structure is the presence of the cubic [Zn4O4] core with alternating zinc and oxygen atoms terminated by organic groups R. When the precursor is heated, the organic parts are degraded, and the inorganic cores self-assemble, forming the final form of the nanomaterial," explains Dr. Sokołowski. The tested precursor had the properties of an insulator, with an energy gap of about five electronvolts. When heated, it eventually transformed into a semiconductor with an energy gap of approximately 3 eV. "An exceptional result of our research was the discovery that at a temperature close to 300 degrees Celsius, the compound suddenly transforms into almost gapless electronic state, showing electrical properties rather more typical of metals. When the temperature rises to approximately 400 degrees, the energy gap suddenly expands to a width characteristic of semiconductor materials. Ultimately, thanks to the combination of advanced synchrotron experiments with quantum-chemical calculations, we have established all the details of these unique transformations," says Dr. Adam Kubas (IPC PAS), who carried out the quantum-chemical calculations. The spectroscopic measurements were carried out using methods developed by Dr. Jakub Szlachetko (Institute of Nuclear Physics PAS, Cracow) and Dr. Jacinto Sa (IPC PAS and Uppsala University) at the Swiss Light Source synchrotron facility at the Paul Scherrer Institute in Villigen, Switzerland. The material was heated in a reaction chamber, and its electron structure was sampled using an X-ray synchrotron beam. The setup allowed for real-time monitoring of the transformations. 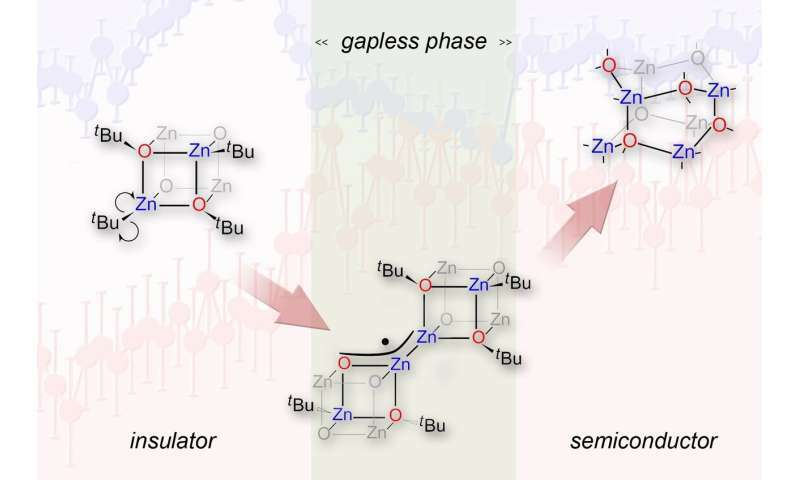 This detailed in situ study of the decomposition process of the zinc alkoxide precursor, supported by computer simulations, revealed that any nucleation or growth of a semiconducting ZnO phase is preceded by cascade transformations involving the formation of previously unreported intermediate radical zinc oxo-alkoxide clusters with gapless electronic states. "In this process, homolytic cleavage of the R-Zn bond is responsible for the initial thermal decomposition process. Computer simulations revealed that the intermediate radical clusters tend to dimerise through an uncommon bimetallic Zn-Zn-bond formation. The following homolytic O-R bond cleavage then leads to sub-nano ZnO clusters which further self-organise to the ZnO nanocrystalline phase," says Dr. Kubas. Until now, the radical zinc oxo clusters formed have not been considered either as intermediate structures on the way to the semiconductor ZnO phase or as potential species accounting for various defect states of ZnO nanocrystals. In a broader context, a deeper understanding of the origin and character of the defects is crucial for structure-property relationships in semiconducting materials. The research, funded by the National Science Centre and the TEAM grant of the Foundation for Polish Science co-financed by the European Union, will contribute to the development of more precise methods of controlling the properties of nanocrystalline zinc oxide. So far, with greater or lesser success, these properties have been explained with the help of various types of material defects. For obvious reasons, however, the analyses have not taken into account the possibility of forming the specific radical zinc-oxo clusters discovered by the Warsaw-based scientists in the material.